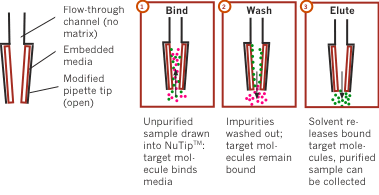 DNA Purification NuTip is based on Glygen’s patented NuTip micro-SPE technology, driving exceptional desalting of DNA/PCR product samples, excellent recovery, and superior processing speed. The DNAPure media is embedded directly in the inner surface of the tip: there are no polymers, glues or matrices. This proprietary design prevents contamination or permeability problems common in competitor tips. Learn more about NuTip technology. NuTip technology has powered research resulting in many publications: Explore literature featuring NuTip. Sold in packs of 96 tips. Click the button below to add the DNA Purification NuTip to your wish list.